He is recognized and certified by the two most significant organisations, ITI Australia and Klindex Australia. Dean has been highlighted in Australians largest cleaning magazine (In Clean) for holding such a fantastic service with 100% customer satisfaction. Over 35 years’ experience as Stone Restoration and Tile Cleaning Specialists in Sydney, Central Coast & Newcastle. Support a wide range of clientele in Sydney to the Central Coast including distinctive homeowners, master builders, interior designers, design centres, and many more. We use high pressure and steam to remove restore the colour of your tile. Travertine is extremely popular as tiles used for floors, walls, back splashes or counter tops. Sandstone is an extremely popular choice of stone for your residential and commercial buildings with a high quality feel, adding value to your building. Limestone is an extremely popular choice of stone for your interior and exterior residential and commercial. Granite is a popular choice when selecting natural stone tiles due to its durability, longevity and the wonderful range of light reflecting effects produced by this beautiful stone. Our team is certified to handle all types of stone polishing projects. 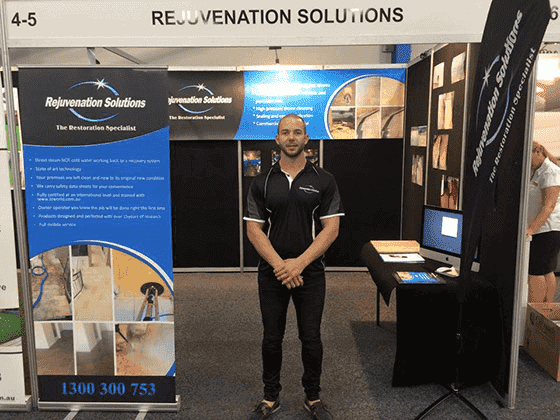 If you need help on limestone cleaning, grinding, polishing or sealing – feel free to call Rejuvenation Solutions at 0411 698 617. Certified through one of the largest organisations – ITI Australia. Been featured in Australians largest cleaning magazine (In Clean) for having such a fantastic service with 100% customer satisfaction. Certified through one of the largest organisations – Klindex Australia. More than 30 years experience in providing rejuvenation services all throughout Sydney, Central Coast and Newcastle Australia. Thanks Dean for all your professional hard work, our beach home limestones tiles and various paved/concrete areas look almost new now, what a huge difference you made,love your attention to detail and pride in your work. Thanks again to you and Alberto. It looks great, and you’ve provided excellent service with the whole way through. If I get the opportunity, I will certainly recommend you. I contacted four companies, and you’ve put the other 3 to shame, so I’m more than happy to help promote your business.